More than 100 school board members from across the state attended the annual MSBA Delegate Assembly Saturday, December 6, in St. Louis Park to help develop policies for the 2015 legislative session. Resolutions are submitted by school board members in early fall and then debated and voted on during the assembly. 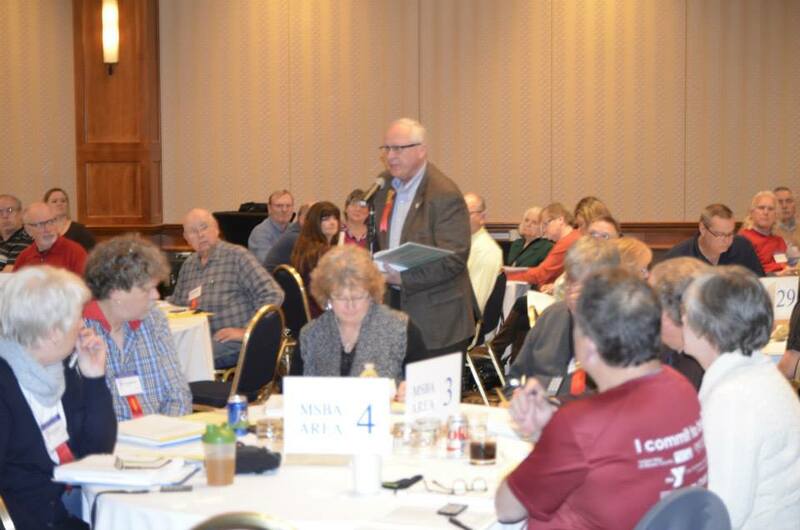 Resolutions that receive a majority vote help define the legislative policies for Minnesota School Boards Association. Virginia School Board member Tim Riordan supports a resolution during the MSBA Delegate Assembly Saturday, December 6, in St. Louis Park. Delegates approved many funding and technology resolutions. A resolution urging the Minnesota Legislature to increase the general education funding formula by a minimum of $300 per pupil unit for the 2015-2016 biennium passed by a decisive 98-4 margin. Other funding-related resolutions that passed included calling for a minimum per student compensatory aid, increasing equalization for school districts receiving less than the state average, and full funding for the concurrent enrollment funding formula. On the technology side, Delegates backed resolutions that would support border-to-border high-speed Internet access for all Minnesotans and establish funding for Internet connectivity and technology equipment. Visit www.mnmsba.org/Portals/0/PDFs/DelegateAssemblyResults-2014.pdf to view the complete voting results. In the next few weeks, we will go more in-depth on this blog with the resolutions that passed and what will mean for the 2015 legislative session. To see photos from this event, please visit MSBA’s Facebook page at www.facebook.com/mnmsba. On Friday, December 5, the MSBA Government Relations team of Grace Keliher and Denise Dittrich introduced MSBA’s Stand Up for Public Education campaign to the Delegate Assembly. Each Delegate was sent home with a “Stand Up For Public Education Tool Kit” that contained materials to help members stand up for public education. 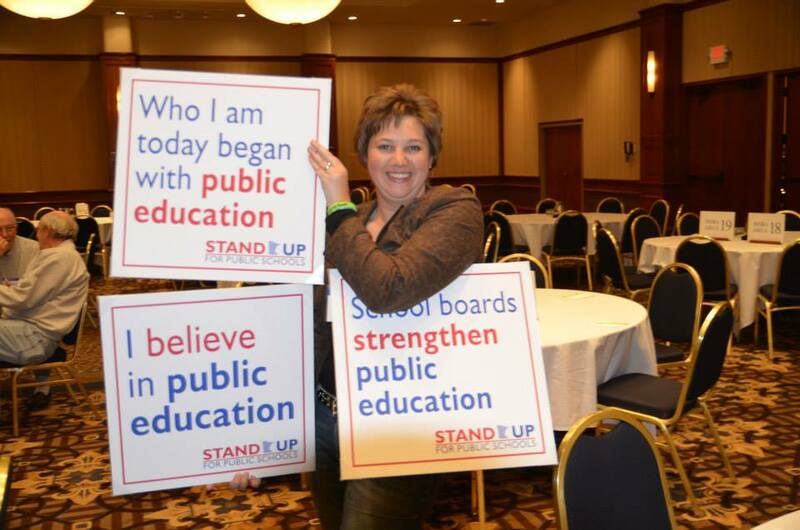 Visit www.mnmsba.org/StandUpForPublicSchoolsToolKit to learn more about this campaign and to access Stand Up resources. Atwater-Cosmos-Grove-City School Board member Jeanna Lilleberg shows her support for public education. Templates for these signs can be downloaded at www.mnmsba.org/StandUpForPublicSchoolsToolKit. This entry was posted in Delegate Assembly and tagged Delegate Assembly. Bookmark the permalink.